I’ve been dabbling with 433 MHz devices over the past few days and tying those devices in with my home automation software named HomeAssistant. 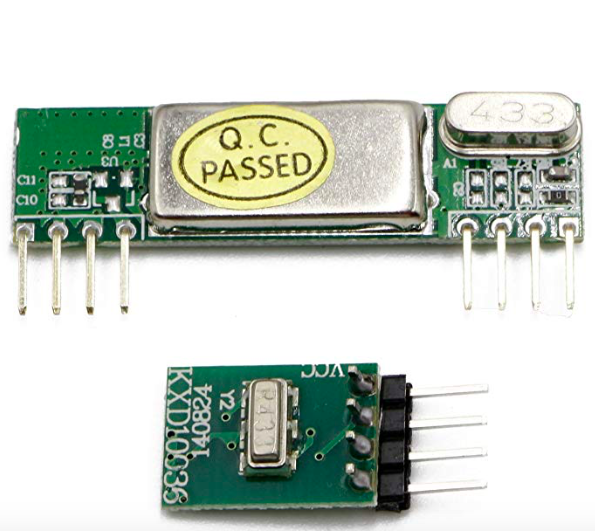 A decent transmitter receiver kit will set you back a whopping $10 or so. I opted for this one. It performs extremely well in a home environment and has great specs. One of the gotchas of this device though is it comes with ABSOLUTELY NO DOCUMENTATION WHATSOEVER. You’d be hard pressed to find much useful on line as well. So that’s where I come in. Fortunately the wiring is pretty basic and the pins are clearly marked on the back side of the circuit boards. Nice guy that I am I made a quick drawing for connecting it all up. 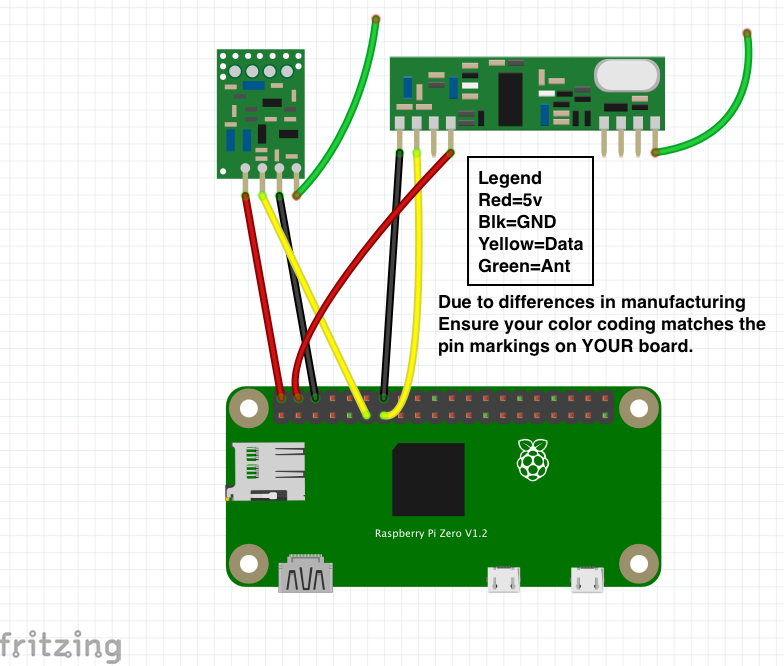 The signal pins are placed on GPIO17(transmitter) and GPIO27(receiver). If the software you are using expects different pins……well…..you’ll have to adjust accordingly. The python script that I use to sniff out remote codes and the HomeAssistant Pi_RF Switch platform I use are wired in this fashion. Here’s my sketch. Now I drew this in a program called “Fritzing” and the components I received have slightly different pinouts than the Fritzing parts did so I made this drawing to match the parts I am holding in my hands. The important part of the drawing is the legend. 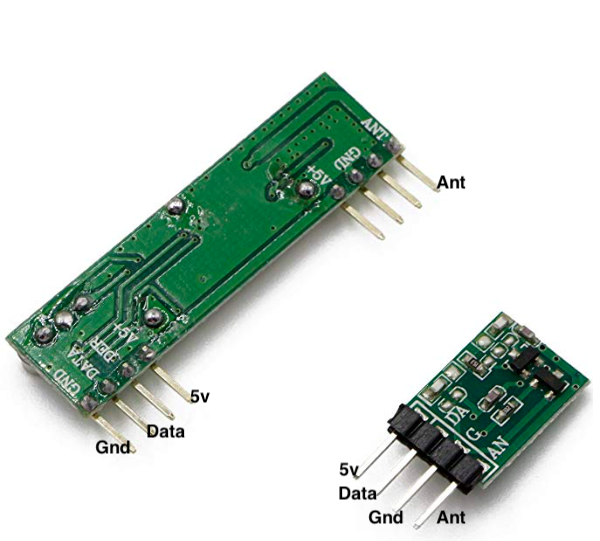 Ensure you are wiring 5v to 5v, GND to GND, and Data to the appropriate GPIO pins. Here’s a pic of the boards showing what pin is what. So the important thing to remember is to ENSURE you are hooking up the appropriate wires to the corresponding pins on the Raspberry Pi which are 100% correct. Now we can talk about sniffing out the codes……………..More on that later……………….. This entry was posted in Raspberry Pi, Software on January 17, 2019 by John Hagensieker.